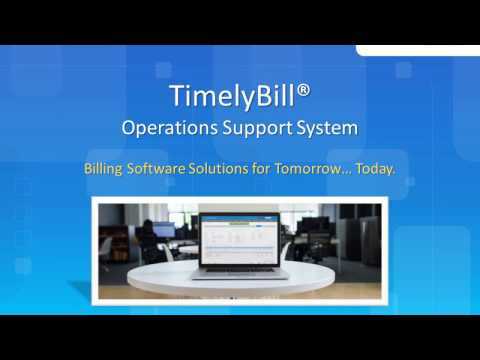 TimelyBill is an integrated system for telecom billing and back office. Comprised of 50+ components, TimelyBill supports full customer life cycle. TimelyBill's unified product catalog enables accurate quoting, fast service bundling and integration of partner products. This flexibility helps users to build unique solutions to meet all of your customers' communications needs. TimelyBill's quote-to-cash feature spans the customer's intent to purchase a telecom service, all the way through to the realization of revenue. TimelyBill is good for ensuring that vendors are paid in a timely fashion and that invoices are recognized and paid. Software allows you to make payments that are scheduled and delivered on time. It works as a memory for the user and sends reminders. Software allows you to make payments that are scheduled and delivered on time. It works as a memory for the user and sends reminders. It could have additional components of use that would make it more high functioning. Contact TimelyBill for pricing information. How does TimelyBill compare with other Finance & Accounting apps? There are currently no reviews of TimelyBill. CRM: create a searchable customer database and view history. Revenue: monitor customer usage to protect revenue. Billing: usage rating, charging, and billing. Reporting: generate reports on taxes, and more. Provisioning: automated flow thru provisioning to hardware. Below are some frequently asked questions for TimelyBill. Q. What type of pricing plans does TimelyBill offer? Q. Who are the typical users of TimelyBill? Q. What languages does TimelyBill support? Q. Does TimelyBill support mobile devices? Q. Does TimelyBill offer an API? Yes, TimelyBill has an API available for use. Q. What other apps does TimelyBill integrate with? Q. What level of support does TimelyBill offer?